Bigfoot researchers have for years, attempted to record sasquatch sounds. Recordings have been made of howlings, grumblings, screeches, wailings, and even knockings. One of the main problems, of course, is it is often the word of the researcher and it often turns out to be a common forest animal. One thing from what is heard from recordings is the howling is often very loud and too much for a regular wolf or coyote. Animals will often mimic sounds they hear, especially with the canine family. The sasquatch sound in general does seem to come from something with a rather complicated language. One researcher has even sworn that he has heard sasquatch cry. From the recordings, it appears to be a very loud howl and is quite disturbing. People have been claiming to hear sasquatch sounds ever since the 1700’s. There was the sasquatch sounds coming from the high Sierra’s and often referred as the Sierra Sounds. Unusual ‘chattering’ was heard very high in the mountains between the years of 1971-1974. Yet, nothing was ever sighted, with the exception of extremely large human-like footprints within the area where the sounds were coming. The sounds were never heard in that area again after ’74. Sasquatch sounds have been heard throughout the mountainous areas and woods from the Sierra’s to the Appalachians. 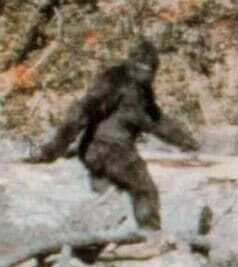 Researchers in Kentucky sat out to locate Bigfoot. Recordings of knocks and possible whistles were made. Researchers will often do a knock first and then the Sasquatch may ‘knock’ back in response. In late December of 2013, the researchers in Ohio County, Kentucky sat up camp. They did the knocks and each time, a single response knock was returned. Once it seemed there was a growl right before one of the researcher’s knocks. It is very likely that Sasquatch would know better than to not allow himself to get close to humanity. A lot of the strange sasquatch sounds cannot be denied though. A few researchers in the area believed they even had the ramblings of an adolescent bigfoot communicating to an older bigfoot. This was recorded. Whether it was truly Sasquatch or human has yet to be proven? The sounds of Sasquatch has been recorded by scientists and has been varied. The most common is the wailing or the howl. What does the animal mean by these sounds? The truth is, we may never really know until coming face to face with an actual sasquatch to be studied. We can go by other animals and realize that they are sensitive to their environment and surroundings. Mocking sounds and as well as communications between more than one sasquatches are all possibilities. Would Sasquatch communicate with us? The knockings show some evidence that he is willing to ‘listen’. Perhaps, someday we’ll know more of Sasquatch. or just use them as a ringtone. Average Hunter will not confirm or deny that any of these sound files are made from the real thing.